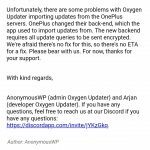 Hi folks, there’s a bad and sad new of OnePlus users as Oxygen Updater will not download OnePlus OTA updates anymore! We have all been through times where we get to know that our phone is getting a new OTA update. Therefore, we get all excited to get the update as soon as possible. But then, the actual update takes many days or even weeks to come to our device. Same is the case with most of the OEMs around the world. OEMs tend to release OTA updates in staged rollouts so the OTA updates are usually delayed. 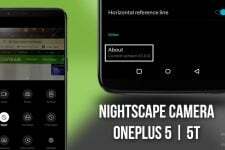 Until now, OnePlus devices were an exception to this as they had an awesome tool known as Oxygen Updater. It is an application available for OnePlus devices and it supports every new OnePlus device. Basically, Oxygen Updater is an application which is used to fetch the latest updates from OnePlus servers at the earlier. 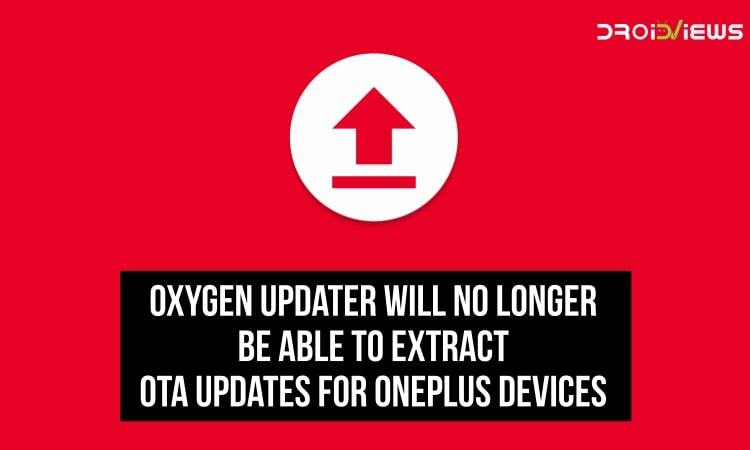 Therefore, if the OnePlus users know that their device is getting a new update, they will head over to Oxygen Updater. Inside the application, they already have the update which they can then download and sideload on their device. This made the process so fast that they don’t have to wait for the OTA update and get the latest update on the same day. 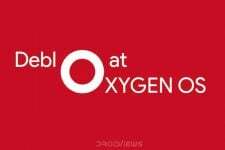 However, there is some bad news in store for you if you are a OnePlus device owner and use Oxygen Updater frequently. The bad news is that Oxygen Updater is no longer able to fetch the latest OTA updates from OnePlus servers. This means that you can no longer get the updates for your OnePlus devices instantly. Rather, you will now have to wait for OnePlus to send the update in a staged manner. 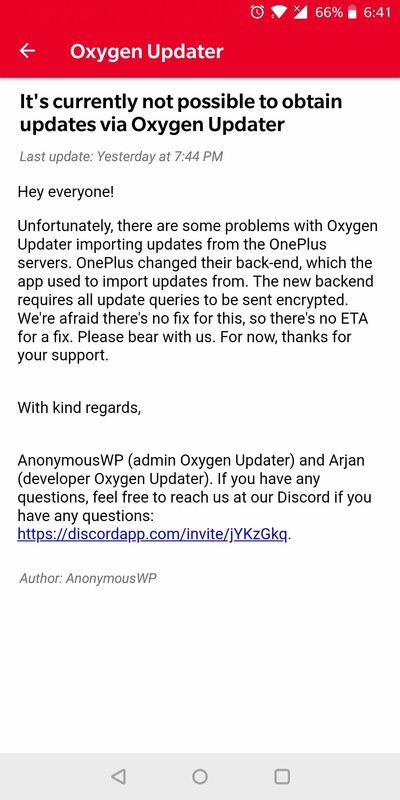 Why is Oxygen Updater not able to fetch updates from OnePlus servers? As per the developers of Oxygen Updater, OnePlus has changed something on the server side of theirs. This means that the app is trying to fetch the updates from OnePlus servers. But as the server side changes have been made, the call from Oxygen Updater is not reaching the OnePlus servers. And therefore, the update is unable to be fetched. It is also obvious that every OnePlus device’s OTA updates come from a single OnePlus server. Therefore, you will no longer be able to fetch updates for any of the OnePlus devices from Oxygen Updater. 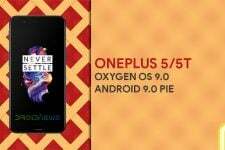 Can Oxygen Updater fetch updates from OnePlus servers once again? We don’t have a proper answer to this question right now. Although, it seems highly unlikely that the issue can be fixed unless and until OnePlus reverts the changes from server-side. Also, the developers have said that “We’re afraid there’s no fix to this so there’s no ETA for a fix”. This statement from the developers of Oxygen Updater, AnonymousWP, and Arjan, give little to no hope that Oxygen Updater will be back. However, we will be on the lookout for any developments in regards to Oxygen Updater when that happens. Also, if the issue will be fixed then we will be the first ones to report about it as well.